I just loaded pcsx2 and can finally emulate my ps2 that had been giving me issues. 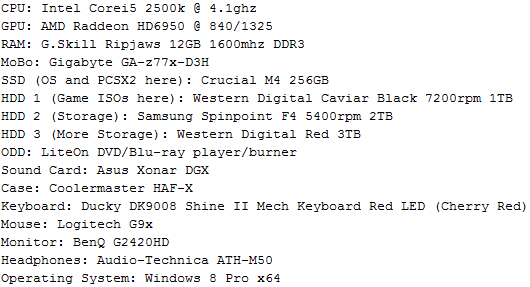 I'm looking for a recommendation for a discrete GPU, since I am currently running just the on-chip Intel HD graphics on my I5-3570K (system runs Windows 7 64 bit, 8 GB ram, SSD). Any suggestions for a card that can support dual DVI and somewhere around the USD $200 price? Right now, my primary graphics need would be pcsx2 (not planning on Crysis or other heavy games). I also do encode a lot, so CUDA will be a plus. I have my eye on a EVGA GTX 650 Ti right now. Also, for the controller, I have an ANCIENT USB Thrustmaster. Any recommendations for a compatible USB controller with vibrate? Wired is ok.
What model number for the controller? The F710 looks nice! Can't go wrong with a PS3 or 360 controller. I recommend a 7870 and a PS2 controller with a PS2 to USB adapter.